SAN DIEGO -- A man who was told no more tickets were available for an Ice Cube concert at a racetrack was shot by a sheriff's deputy after he fired his gun into a crowd, the San Diego Sheriff's Department said. The man, whose name and age weren't given, came to the ticket window at the Del Mar Fairgrounds about 6:40 p.m., the department said in a news release. 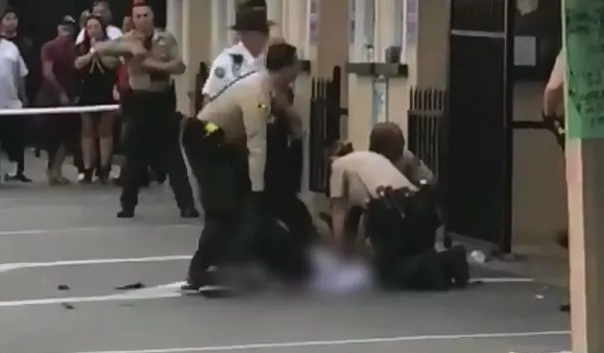 CBS San Diego affiliate KFMB-TV quotes witnesses as saying the man fired three times into the air and that sheriffs Tased the suspect and opened fire when that didn't stop him. The man was taken to Scripps Memorial Hospital La Jolla, the department said. His condition hasn't been released. In a broadcast of the track's final race of the day that was posted on Twitter, an announcer can be heard saying, "There's gunfire at the track," as horses move along the turf course. At 7:22 p.m., the racetrack tweeted that the "situation has been contained" and said the concert "is moving forward as planned."